The Global Precipitation Measurement mission or GPM core observatory satellite provided very good coverage of hurricane John when it passed above the eye of the tropical cyclone on August 8, 2018. GPM found heavy rainfall within the large hurricane. 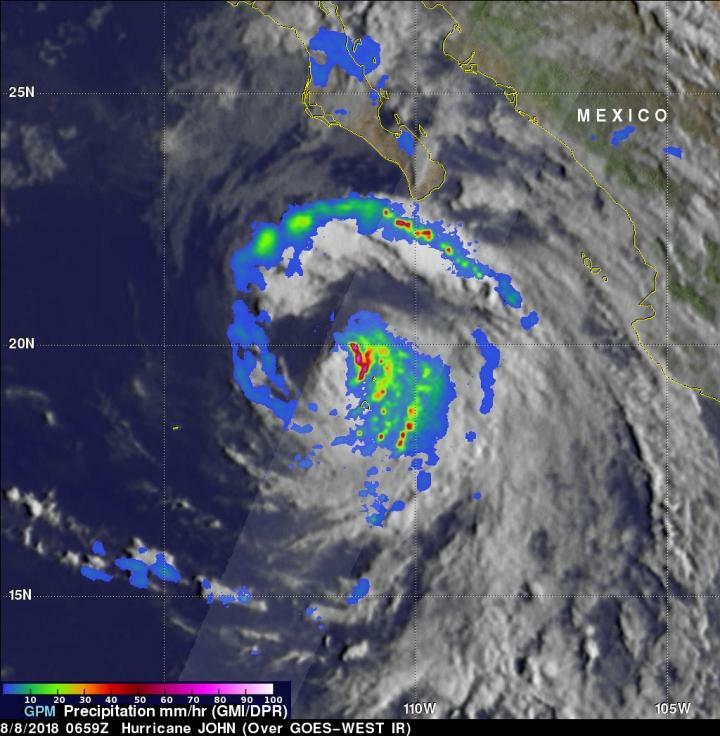 Two hours later, the National Hurricane Center said outer bands of large hurricane John was producing locally heavy rainfall over southern Baja California, Mexico. GPM flew over John at 2:59 a.m. EDT (0659 UTC) on Aug.8. At that time John's maximum sustained wind speeds had started to decrease. GPM's Microwave Imager (GMI) and Dual-Frequency Precipitation Radar (DPR) instruments showed that most of John's precipitation was then located in the eastern half of the hurricane. A large cloud free area had developed between the center of the hurricane and an intense feeder band wrapping around the northern and western side of the hurricane. GPM's radar (DPR Ku Band) revealed that extremely heavy rainfall was still falling at a rate of over 202 mm (almost 2 inches) per hour just east of John's eye. At NASA's Goddard Space Flight Center in Greenbelt, Md. a 3-D cross-section through hurricane John's precipitation was derived from GPM radar data (DPR Ku Band). Those data showed that the tops of powerful storms in the eastern side of John's eye wall were reaching altitudes of about 12 km (7.4 miles). Storms in the intense feeder band well north of John's eye were even higher. Probes by GPM's radar showed that storms in that area that were reaching heights above 13.5 km (8.4 miles). GPM is a joint mission between NASA and the Japan Aerospace Exploration Agency, JAXA. At 11 a.m. EDT (1500 UTC), the center of Hurricane John was located near latitude 20.7 North, longitude 112.3 West. John is moving toward the northwest near 12 mph (19 kph), and this general motion is expected to continue through Thursday. A turn toward the west-northwest is expected by Friday. On the forecast track, the center of John will pass well to the southwest of Baja California Sur today through Thursday. (185 km). The estimated minimum central pressure is 979 millibars. The National Hurricane Center (NHC) predicts that Hurricane John will gradually weaken as it moves northwestward over cooler ocean waters. John is expected to stay well off shore of the Baja California Peninsula and its winds are expected to weaken to below 60 knots (69 mph) after tomorrow, Aug. 9. However, the NHC cautioned interests in the southern portion of the Baja California peninsula should monitor the progress of John due to locally heavy rainfall.